It has been shown that many networks associated with complex systems are small-world (they have both a large local clustering coefficient and a small diameter) and also scale-free (the degrees are distributed according to a power law). Moreover, these networks are very often hierarchical, as they describe the modularity of the systems that are modeled. Most of the studies for complex networks are based on stochastic methods. However, a deterministic method, with an exact determination of the main relevant parameters of the networks, has proven useful. Indeed, this approach complements and enhances the probabilistic and simulation techniques and, therefore, it provides a better understanding of the modeled systems. In this paper we find the radius, diameter, clustering coefficient and degree distribution of a generic family of deterministic hierarchical small-world scale-free networks that has been considered for modeling real-life complex systems. 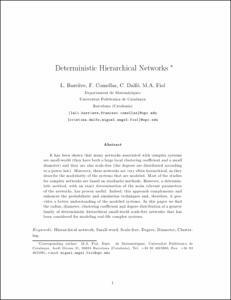 Barriere, E., Comellas, F., Dalfo, C., Fiol, M. Deterministic hierarchical networks. "Journal of physics A. Mathematical and theoretical", 2016, vol. 49, núm. 22, p. 1-19.